THE COUNTRY’S BIGGEST motorway has witnessed more than 5,100 accidents and incidents since the beginning of 2017. Dublin’s M50 ring road has recorded “incidents” at the rate of over 243 per month, according to a detailed list provided by Transport Infrastructure Ireland. The events vary from low priority to major incidents with drivers falling ill at the wheel, wild animals on the road, and cases of motorists going the wrong direction all reported. The most common incident was breakdown with more than 2,000 cars breaking down over a twenty one month period on the motorway. Just over 1,000 collisions were also recorded while 643 incidents were reported where dangerous debris was found to be on the roadway. A total of 49 drivers ran out of fuel on the busy motorway while there were 47 cases of wild or pet animals crossing the carriageways. Transport Infrastructure Ireland also recorded 272 cases where a pedestrian or cyclist was found to be using the motorway, putting their own lives and those of drivers at risk. Dead animals were reported sixteen times, which can cause motorists to swerve to avoid the carcass and lead to collisions. Twenty three cases of drivers falling seriously ill were also recorded, while in 25 cases, somebody called for help but there was nobody on the line. There were two cases of drivers headed the wrong way on the M50 while three cases of serious anti-social behaviour were also recorded. Other serious incidents reported included heavy winds putting traffic in danger (ten times), 35 cases of vehicles on fire, 121 flat tyres or “blow-outs”, and 173 instances of cars being abandoned by the side of the road. Less frequently reported but also listed in the database were spillages, flooding, and drivers hopelessly lost and looking for directions. Of the 5,115 incidents reported, 28 of them were classified as “major incidents”. These mostly involved serious collisions, or cars broken down in dangerous locations, with some incidents lasting for up to six hours. Another 905 incidents were classified as “high priority”, a majority of them breakdowns and crashes. A total of 2,137 events were categorised as “moderate priority” with another 1,779 described as “low priority”, often involving mechanical failures in cars but where the driver was able to get the vehicle to a safe place on the hard shoulder. The time of year doesn’t appear to have much impact on how many incidents take place with numbers fluctuating randomly from month to month. The worst month over the past twenty one months was in May 2017 when 320 incidents were recorded, more than 10% higher than any other similar period. The “Beast from the East” snowstorms in March don’t appear to have had a significant effect on the numbers of incidents with 222 recorded that month. That figure did drop however in April to just 174 – the lowest since the beginning of January 2017 – before rebounding again during the summer. A spokesman for Transport Infrastructure Ireland said that with 50 million journeys a year, the motorway was no longer a ring road but rather within the city suburbs. 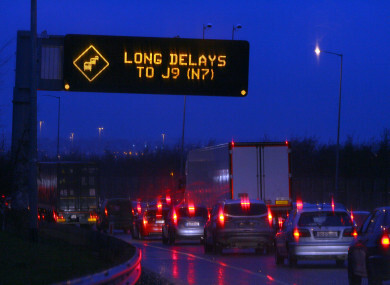 He said incidents on the M50 combined with heavy traffic were a recipe for long delays. “Incidents can include anything from simple breakdowns, or debris on the motorway right up to major collisions involving multiple vehicles,” he said. More serious incidents generally require the involvement of many different agencies including An Garda Síochána, Dublin Fire Brigade, the four Dublin local authorities, [ourselves] and the Motorway Traffic Control Centre. As part of plans to ease congestion on the road, Transport Infrastructure Ireland is planning to introduce “intelligent transport systems technologies” including variable speed limits as well as lane usage instructions by 2020. “A regulated speed limit will reduce the need to brake suddenly in response to standstill traffic and reduce the number of ‘stops and starts’ that take place,” said Sean O’Neill. Email “Over 5,000 accidents on M50 since 2017”. Feedback on “Over 5,000 accidents on M50 since 2017”.